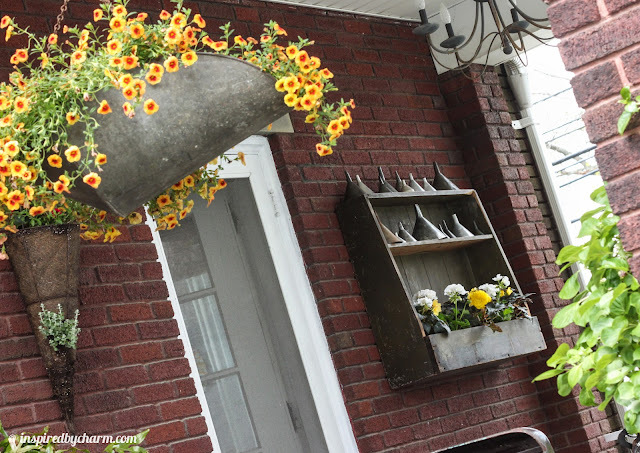 I hope I’m not over doing it with all this talk of being outside and planting flowers and working on porches. It’s just where I find myself spending my days lately, and I love it. I was actually at a greenhouse/landscaping place last week and was so disappointed I couldn’t buy more shrubs and trees. This year I officially don’t need anymore. Hard to believe. Well, I finally got it hung and decorated! Check it out. I began by loading the top two shelves up with some funnels I’d been collecting for a christmas project that I never got to last year. I honestly didn’t realize how many I had until I set them all up. Quite the collection. I then filled in the bottom of the shelf with flowers. This area doesn’t get a lot of sunlight so I planted each individual flower in a clay pot. 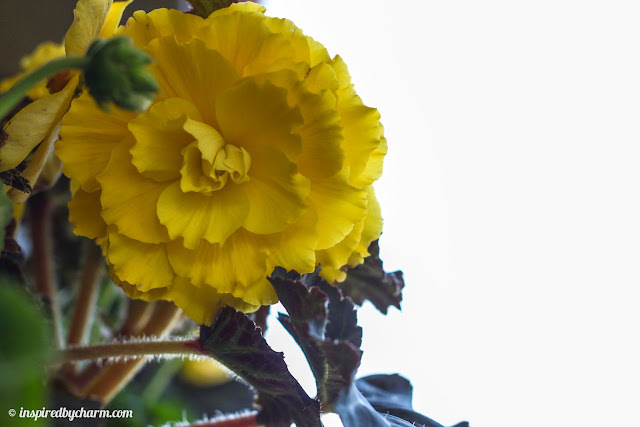 The begonias should be okay with not so much sunlight, but the geraniums may need a bit more direct light. Since they are in pots I can switch them out with some other geraniums that I have in the same size pots in a more sunny location. Smart! 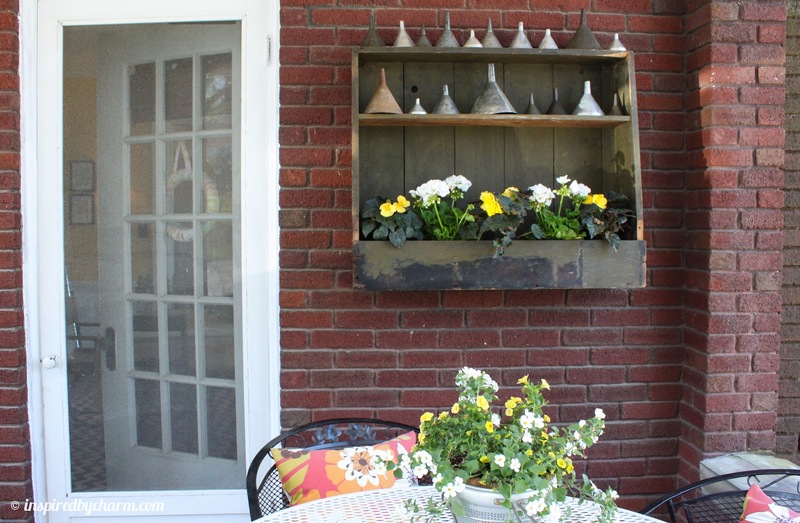 This new shelf is on my side porch where, if you remember, I hung my giant scale turned planter…. 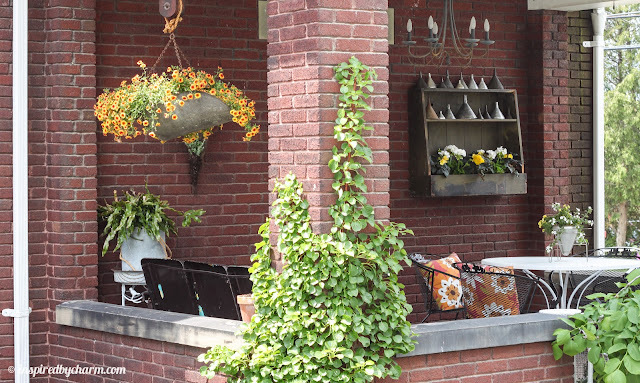 … and where I have one of my food mill planters. So, the shelf isn’t the perfect color and it’s a bit too rustic for me, so I’m pondering ways to make it a little more contemporary but I haven’t quite figure it out yet. But, for now, Im really pleased with it and the overall look is just fab! Another project to cross off my list. What do you think of my shelf? And ideas to make it more contemporary? Or do you like it just they way it is? 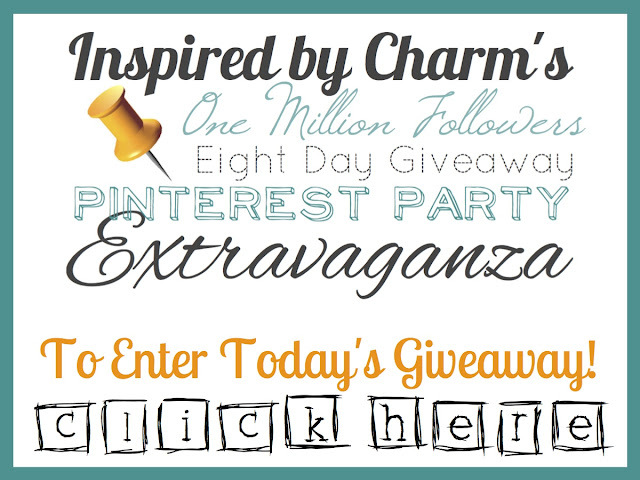 And now it’s time for Day Three of Inspired by Charm’s One Millon Followers Eight Day Giveaway Pinterest Party Extravaganza! 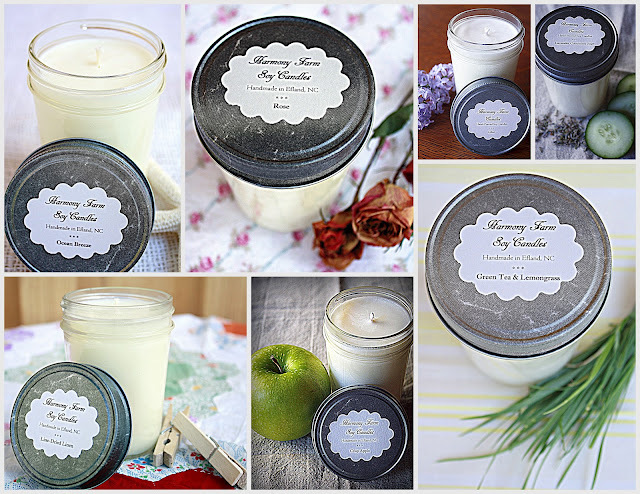 Today’s giveaway comes from the beautiful Harmony Farm Candles. THREE candles of the winners choice! Love that shelf! I love the funnels AND the scale-turned-planter! I get such a thrill from repurposing things and I can tell you do, too! You could soften the look of the shelf by adding some jars (old or new, clear or colored). The translucent effect might be nice against your brick wall! 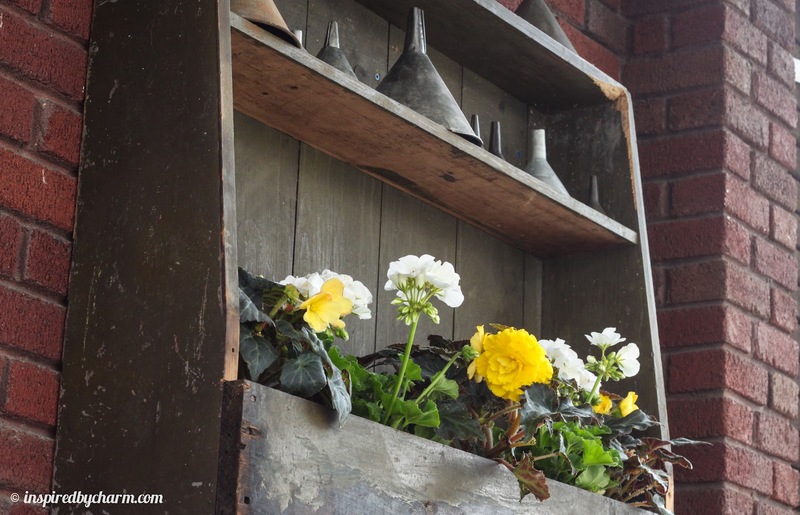 I love the shelf like it is but knowing me…if you do something more to it I will love that also! I went over to the candle site and I would choose English Garden Gardenia and Lilac. I burn candles by season and decorate that way too. 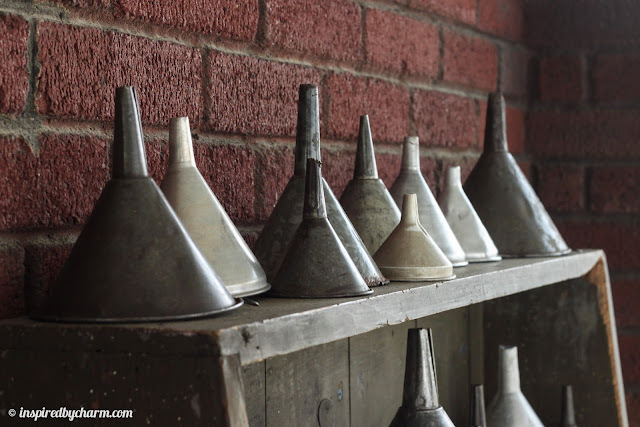 I have been collecting funnels too for some project and I can’t even remember for what but I don’t have as many as you do. Smart idea about the geraniums! Oh, BTW, I have your Pink Malted Milk Ball cake on my Memorial Day menu…if I can wait that long to make it! LOL! I happen to like it just the way it is. But I like rustic. I am really into gardening this time of year, so I love the garden posts. i think the new shelf is perfect fit with everything else on porch…..you know if you spend eve’s out there the top shelf done in some jars with candles in them would be nice looking. It’s a toss up between the line dried linen and the lemon cookie. Both sound wonderful! Love it the way it is!!!!! I think the shelf looks great as is, but if you wanted to freshen it up, maybe a whitewash? Or that part on the bottom with the flowers, would look great with a “sign” of sorts painted on it! If it’s a door that is used by guests, then maybe “Welcome.” If it’s not used by guests then you’d probably want to do something else because Welcome could lead them to believe they should come in that way! Maybe something gardeny- but my preggo brain isn’t too clever right now….something like Grow, Plant, etc….? 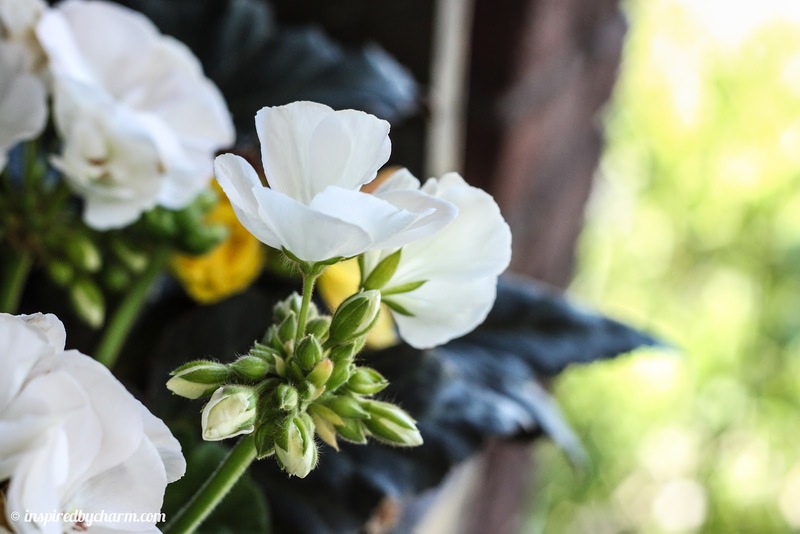 I’m vicariously living through your gardening as I haven’t done ANY this year! Mostly bc of being sick pregnant and because we are hoping to move soon! Love all these posts lately! I am lusting after that shelf ! I really enjoyed seeing that someone else collects funnels. Then I wondered what you were doing with them until I saw your comment about the Christmas project. Were you going to make a tree out of stacking them ? That’s what I’m saving mine for. I still need some more to do that. I also have the giant scale container like yours. Aren’t they cool ! thanks for sharing your porch. 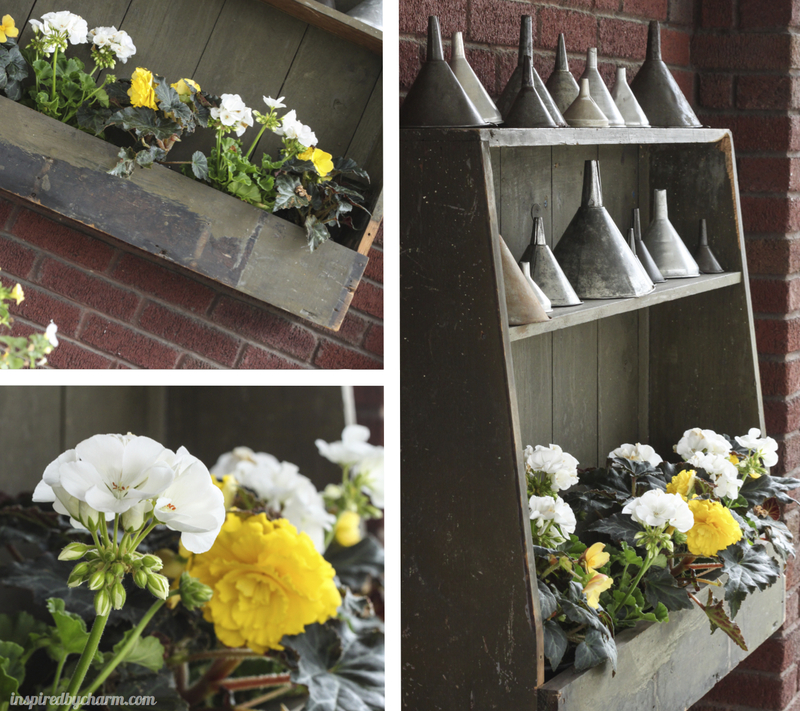 I’m a plant freak that also enjoys using old found objects for decorating. It looks great in it’s rustic state but if you wanted to update it, I would paint it. I’d do a crisp white on the sides and front then use a pale grey or taupe and paint every other board on the inside grey and the other 2 white. It would add some pop without overpowering the flowers. I’ll email a photo of what I am taking about. 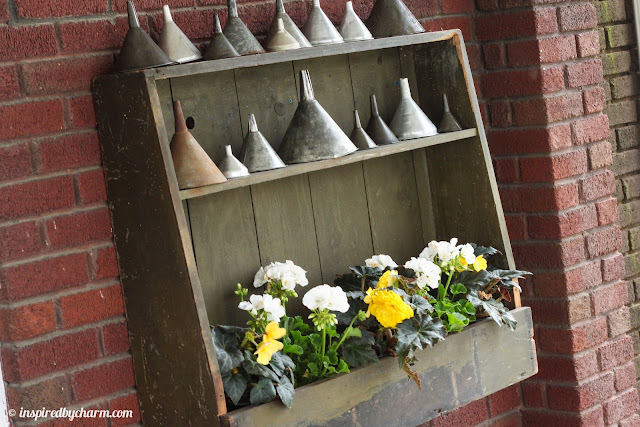 I LOVE the scale planter and the funnels. Great collection. Those lemon cookie candles are AMAZING! i love how they make my kitchen smell clean! I would paint the shelf yellow or orange to match the colors of the flowers in the scale. And if you ever change those flowers, just repaint the shelf!! I love the look of your porch! If you wanted to change it a bit – why not tack on some metal of some kind – perhaps copper flashing or something along those lines? That would look pretty smart as well!! Love your blog!!! My vote is to leave the shelf as is. 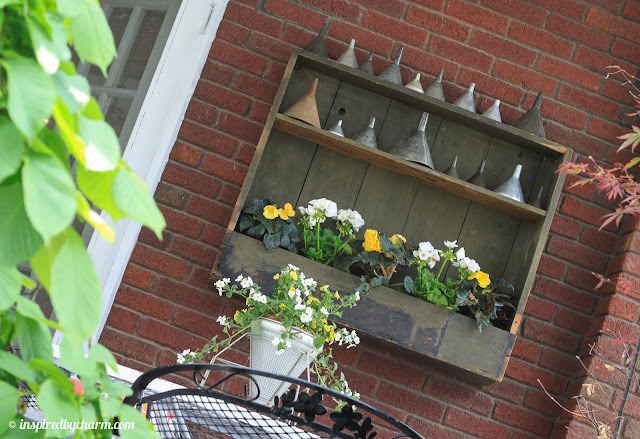 It looks great with all the galvanized stuff you have out. Love this. What a great touch! I would love to see another unique garden project. I love all your ideas. I would love, love, love to see another amazing sign (PLEASE) It’s what caught my eye and started me following you and being utterly inspired by your charm (and wit)! I’d also love to see a water creation….I know this is kind of vague but I know you love to garden, plant and be creative in your presentations and planters…..how about a water feature, fountain, rock pond, birdbath…..I know with your creativity and inspiring ideas you can make this happen!!!!!!! I love the shelf the way it is, it partners perfectly with the scale!